Ever since Microsoft made Windows 10 a recommended update there have been numerous reports of the new operating system installing itself without user consent, and without much warning. 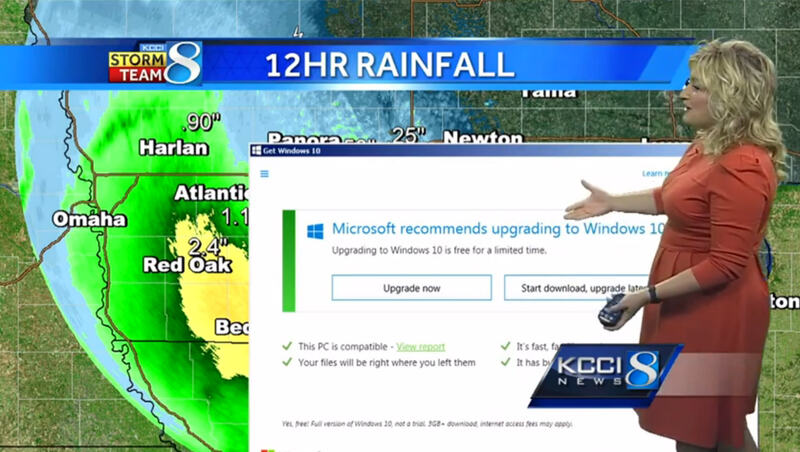 Microsoft has always played down this behavior, but an example of how the OS pushes upgrades on unsuspecting users was earlier today shown live on TV during a weather forecast. If you’re in Iowa you might have seen KCCI 8 News Meteorologist Metinka Slater’s thunderstorm update and warning of 12 hours of heavy rainfall interrupted by an unwelcome upgrade message covering up much of the radar screen. If you’re not in Iowa, or missed it, you can watch the amusing moment below. "Microsoft recommends upgrade to Windows 10, what should I do?" a surprised Slater asked. As always the annoying window offered two choices -- 'Upgrade now', or 'Start download, upgrade later'. Slater wisely chose neither option and switched to another video source instead.